I placed the order on a Friday afternoon; it arrived on the following Thursday – great service from Hobby Zone and UPS and at only £12 flat postage a good deal too. The order arrived in one large box, with each individual module being packed in its own cardboard box and bubble wrap. In the box was my receipt, a free Hobby Zone pencil and a couple of free Hobby Zone stickers. Each individual module is well labelled with its title and opens along the top flap allowing you to keep all items together whilst working. The instructions are well printed and easy to understand; think Ikea for modellers – if you can put a 1/35 Tiger or T-55 together you’ll have no problems here. One area to watch out for is the drawers with clear windows: there is a very shallow notch in one side of the drawer sides to allow the window to sit flush – I missed this and had to pull a few of my drawers apart to get the windows in. You’ll need some wood glue – I used an economy brand and a cheap paint brush for ease of control; I also used wet wipes to tidy up glue overspill caused as the parts went together. On completion the modules link together with strong magnets. A handy tip is to remove all the magnets from the boxes – line them up so that they are all connected and aligned by their poles. Then mark one side of the ‘top’ magnet with a permanent marker pen, remove it and continue to do the same with all of the individual magnets. This will ensure that you’ll know which side of the magnet is which when fitting – I’d also strongly suggest fitting the magnets before starting assembly. They are a very tight fit and need a tap with a plastic mallet, quite difficult to do when the module is assembled. Each module takes a slightly different time to put together: about 5 minutes for the top corner units; about 15-20 minutes for the 6 drawer units. I worked over one day in three sessions and easily completed all the modules allowing them to dry overnight. Quick and relatively easy to assemble, the magnets hold the modules together very well and once linked the whole workshop feels very solid. The larger draw units have dividers which can be customised, or left out if you need a larger space. I’m going to customise the OM05u bottles module by drilling different sized holes in the white shelves and making at least one of them into a rotary (Dremel) tool stand. I may also make the second one a file and tweezers holder, amongst other tools as well. Highs: Quick postage from Poland. ‘Professional’ feel and presentation. 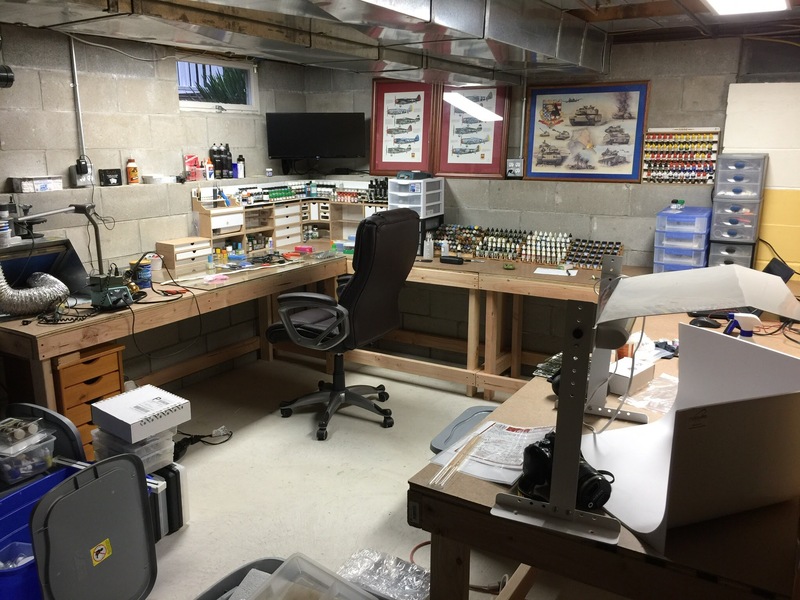 My wife no longer moans about the state of my modelling bench! Lows: Would have liked to see glue sachets included with each module. My wife knows how much it cost! Copyright ©2019 text by Ian Barraclough [ BARRA733 ]. Images also by copyright holder unless otherwise noted. Opinions expressed are those of the author(s) and not necessarily those of AeroScale. All rights reserved. Hi Ian, how are you finding these after having had them a year? I'm thinking of getting some of the units and would appreciate your feedback now please. Any picture of how they look after a year of use? Here is my setup in various stages of completetion with the system. Found the oil paint holder to be pretty much useless and replaced it with another bottle setup. Nice work area Scott. So you'd recommend these units? I've had mine for about 18 months - I bought them when they were first released. This is easily one of the most innovative hobby products released and I would recommend them to anyone. They keep everything organized and really were developed with modellers in mind. Well worth the money! They seem quite durable, I gave mine a spray of varnish so they wouldn't soak up any spills of thinners etch on the bench as I was concerned due to the type of material. Works a treat, about to order some more, can't gave enough drawer units. I'm very happy with them outside of the oil paint holder they make..they didn't work well with some the brands of oil paint tubes I had. Otherwise they work great. The only "problem" I have now is I actually have too much storage space for smaller things, because I also have two wooden tool chests next to my desk that I used prior to getting them. Likely a stupid question, the green desk mat. Where can one find one of those. 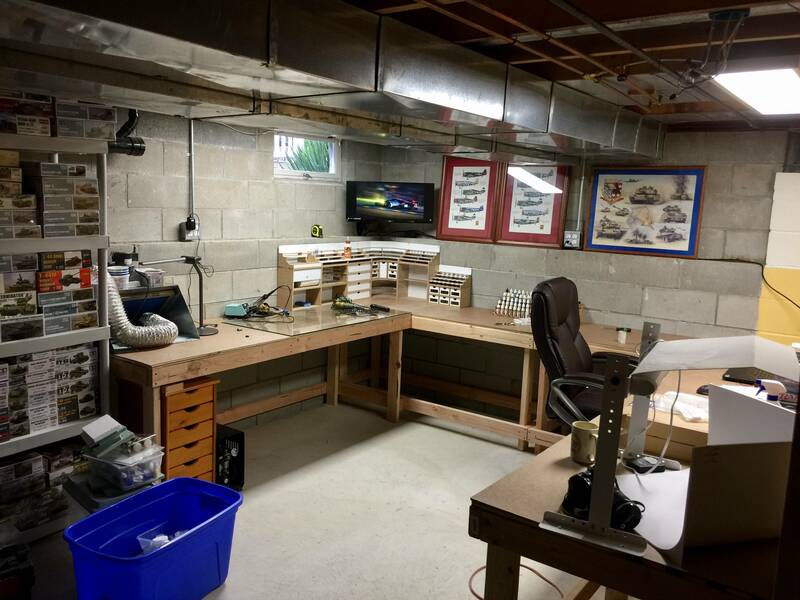 I have a new workbench and my old desk mat was thrown out. I've seen them in many posts on here but can seem to track it down. After a years use I find these still to be the best thing that's happened to my modelling desk! They are durable and provide all the storage I need - I've even added a self made 'go to' tool holder that holds my everyday tools at 45 degrees directly in front of where I work. The only downside I can mention is that if an area gets wet, the soft MDF deforms and can peel. This has happened directly beneath where I store three pipette droppers that I use for thinners and water.